The TM-RS1000 is a very versatile yet easy to use Portable Tabletop Machine intended for general re-spooling applications. Any sized spool up to 400mm can be mounted on both the pay off and take up side of the machine. No tools are required. The machine can run at variable speeds up to 150meters/min and displays length with 0.1meter resolution. A rolling ring traversing head ensures even layering on the take up spool. It operates in manual or auto modes with a very simple two-button operation. In the auto mode, the operator enters a desired length and speed. The TM-RS1000 will then stop automatically when the desired length is reached with 5mm repeatability. The design of the TM-RS1000 also takes into consideration the importance of screening your wire, cable, fiber, etc. for surface flaws and defects to ensure that only good quality material passes to the take-up spool. 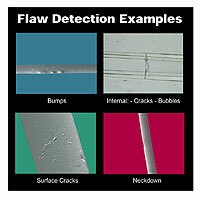 Nicks, bumps, neckdowns, bubbles and other surface anomalies as small as 10µm can be easily detected. 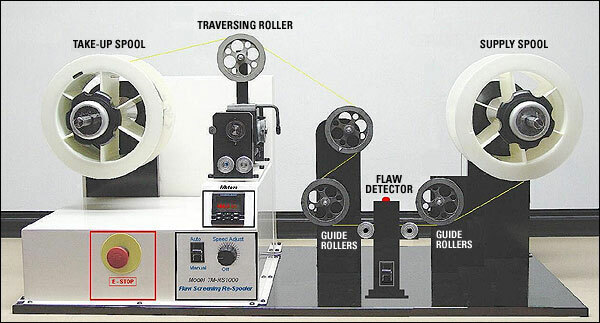 Once a flaw has been identified, the machine automatically stops and then reverses direction to bring the flaw event to a specific detail zone to allow the operator to mark or repair the area of concern. 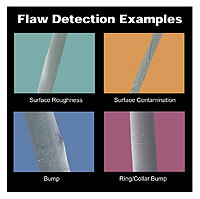 EMAC-005 Elastic String Marker automatically snaps on elastic band on the flaw event for easy identification of defect. AL-03 Audible Buzzer with Visual Strobe Alarm with flaw counter. 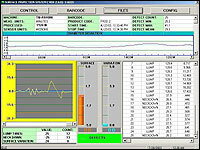 TM-SIS Flaw & Roughness Analysis System displays, measures, characterizes and archives all flaw and wire diameter data. Complete SPC report in hard copy and electronic format. Conversion Chart | What's Your Application? Copyright© 2004 D.A.S Distribution, Inc.